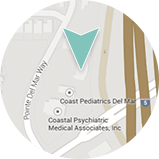 Dermatology & Laser of Del Mar, one of the premier cosmetic laser surgery centers in Southern California and dedicated to excellence in skin care and rejuvenation, offers the most advanced laser technology for hair removal. As a leading expert in laser surgery, Dr. Deborah Atkin safely and effectively uses the GentleMAX® laser for permanent hair reduction for all skin and hair types-for men and women. The new GentleMAX® laser works by generating a gentle beam of light that passes through the skin and destroys the hair follicle without damaging the surrounding tissue. The GentleMAX® is one of the most advanced hair removal lasers, with a unique cooling system offering greater safety and comfort. Dr. Atkin also uses the GentleMAX® laser for Photorejuvenation of the skin, eliminating unsightly skin discoloration. Did You Know?The GentleMAX ® laser’s dual alexandrite and YAG wavelengths can safely and effectively treat darker skin types without risk of hyperpigmentation or hypopigmentation. Laser Hair Removal may require several treatments to achieve your desired results. Typically laser hair removal sessions are spaced 6 to 8weeks apart, depending on the patient. Length of Time for Procedure –Sessions can be as fast as 15 minutes up to an hour, depending on the size and number of treated areas. Who Will Perform This Procedure? – Deborah H. Atkin, M.D., our board-certified dermatologist, will perform this procedure. What is the Recovery Time? There is no downtime from laser hair removal with GentleMAX® YAG. Final Results of the Procedure – With every session you will see significant reduction in the amount of hair in the treated area. Other Treatments or Skincare Products that May Improve My Result? In between treatments, it is recommended that patients not wax, pluck, or use hair removal creams. 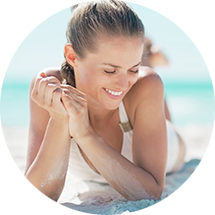 Sunscreen is recommended for daily use, but it is particularly important after any laser treatment as the skin can be more photosensitive. SkinMedica’s Environmental Defense SPF+30 or 50 provides great protection and is non-comedogenic. To help you make the best decision for your needs and goals, Dr. Atkin has provided answers to some frequently asked questions (FAQs) about this procedure. To learn more about GentleMAX® or to schedule an appointment, please contact our office today. than others? How do I know if I’m a good candidate? The best candidates for laser hair removal are those with lighter skin and dark hair. Laser hair removal works by targeting a substance called melanin that’s present in both dark hair and dark skin. Laser hair removal will not be effective for hair that is graying or blonde. We offer consultations in office to evaluate your areas of concern in order to determine if laser hair removal is right for you. Is laser hair removal with GentleMAX® painful or uncomfortable? Laser hair removal can be uncomfortable or painful depending on the area being treated. We offer topical numbing to be applied prior to treatment in order to make your session more comfortable for you. How many treatments with GentleMAX® are required to see results? Depending on the area, as well as the coarseness and color of the hair being treated, multiple treatments may be required. Generally patients will have 3-6 treatments. That being said, you will see improvement with each treatment. One of our trained providers will be able to discuss with you a realistic number of treatments when you are seen for a consult. Are there any side effects for hair removal risks I should be aware of? While not common, there can be side effects from having laser hair removal. You may experience temporary skin irritation, discomfort, and redness. Depending on your skin tone, you may experience what is usually temporary darkening or lightening of the treated area. It is always best to have a consult before having laser hair removal performed. Is laser hair removal with GentleMAX® a permanent solution? While it is difficult to predict the effects of the procedure and how long it will last, we do know that the FDA has cleared GentleMAX® for permanent hair reduction. Patients are generally very pleased with the significant and long-term reduction they have after treatment.